NEWPORT NEWS, VA. – Some of the top cyber experts in Virginia will converge at the U.S. Department of Energy's Thomas Jefferson National Accelerator Facility to discuss keeping physical systems safe from cyber threats. The Governor of the Commonwealth of Virginia, in partnership with the National Governors Association, will host the Cyber Physical Systems Summit at Jefferson Lab Sept. 20-22, a first-of-its-kind event in the Commonwealth that is expected to be one of the greatest gatherings of cyber-physical professionals in the nation. The three-day event will bring together cybersecurity professionals from a wide array of business, government and non-profit organizations to discuss the challenges they face and the opportunities to improve the security of the wide range of devices and systems that are connected via the Internet, from public utilities to your average smartphone, without sacrificing device utility or the security of the networks connecting them. Topics of discussion will center on ensuring the security of technologies that offer convenience and improved functionality by connecting to the Internet, the so-called “Internet of Things” in our everyday lives. For instance, participants will discuss the broad impact that the cybersecurity of connected devices has on businesses and utilities, including the challenge of implementing protections for the power grid, telecommunications networks and water distribution systems. A number of topics will be addressed that involve connected devices, including everything from smart refrigerators that quote the weather, to cars that provide their own wireless hot spots, to medical devices that share your data with your doctor. On day two of the summit, participants will hear remarks from Summit Host Terry McAuliffe, Governor of Virginia and Chairman of the National Governors Association, and recorded remarks from Former Virginia Governor, now Senator, Mark R. Warner. According to the summit website, roundtable sessions are being held in conjunction with McAuliffe’s National Governors Association 2016-2017 Chair’s Initiative: “Meet the Threat: States Confront the Cyber Challenge.” The roundtables will be facilitated by the National Governors Association and the Business Higher Education Forum. Registration is still open for the summit, but seating is limited. 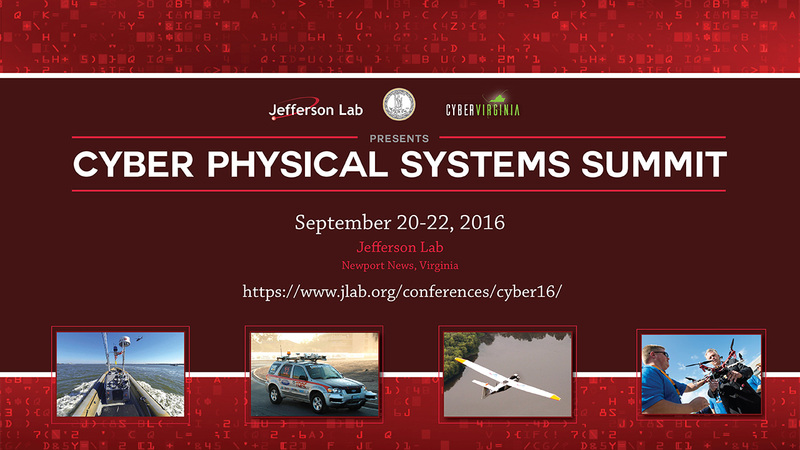 Registration, the program and other details may be found on the Cyber Physical Systems Summit website. Media may attend all or any portion of the event. Please contact Jefferson Lab Public Affairs at jlabinfo@jlab.org no later than noon Monday, Sept. 19, if your organization plans to send representatives.